Just like people, animals need not only physical but also mental activity to keep them stimulated and alert and to facilitate their mental development. Another similarity between people and animals is that they learn by doing and they learn best with activities that are hands-on. This is done with toys that are more advanced than balls they can fetch or bone-shaped items they can chew on. This is the mission of Nina Ottosson puzzles and toys which are made specifically for your pet. Nina Ottosson is the pioneer of activity games and toys, a venture she started in 1990. Her mission was to create games and toys that will exercise your pet's mind as well as their body. In doing so, boredom is prevented and so are behaviour problems. Playing such games with your pet will also strengthen bond between pet and pet owner. Dogs need the same range of daily mental and physical activities as people. An animal that spends a lot of time lying around without engaging in any physical and mental activity is bored, inactive and is not developing mentally or physically. These furry friends may develop weight problems or may be hyperactive and have behaviour that upsets their owner such as dashing around, not taking instructions like staying when asked to and chewing on anything they can get. 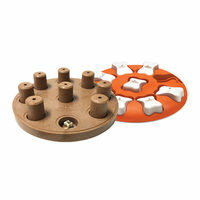 The Nina Ottosson range of interactive toys and games for dogs were designed to stimulate their brain. 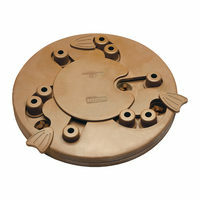 Each one has a unique mechanism that calls to use mental and physical dexterity to work through the puzzle or challenge and reach hidden food rewards. The games can be programmed to different levels of complexity and ages, from young puppies to older pooches who can handle more complex challenges. 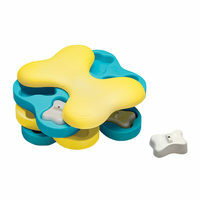 Popular games are Nina Ottosson Dog Twister and Nina Ottosson Dog Brick. The way Nina Ottosson games and toys work is that pets solve problems in different ways. 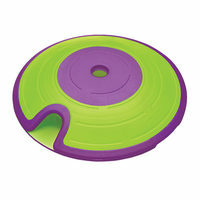 This may be finding hidden treats by lifting blocks, pushing them, turning discs or assembling blocks in place. 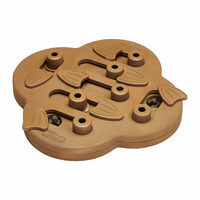 Apart from having to figure out how things work, this also works to teach dogs obedience. Seeing rewards when they have completed a task or challenge as expected motivates them to follow commands outside of game time. Getting praise and attention from their owner during a game also strengthens the bond with their owner which makes them more receptive to taking instructions from them. Nina Ottosson games come with food rewards for a purpose. Eating is important for survival so it is instrumental in getting your pooch to pay attention and stay focused on a challenge until they solve it so that they can eat. 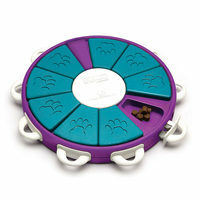 Her dog toys and dog puzzles also incorporate activities like hunting and movement to sharpen the natural instincts a dog has to use their sense of smell to explore and hunt. In creating dog toys and dog puzzles, Nina Ottosson recognised that a lot of different breeds, ages and sizes have different abilities and preferences. This is why the games can be programmed to be easy for puppies and for breeds that are less aggressive or alert. Beginner level games can be introduced to puppies that are at least 10 weeks old. This can be for just a short time, say 10 minutes. More challenging levels and longer play times should be introduced gradually as your pet develops a knack for them and enjoys playing for longer. 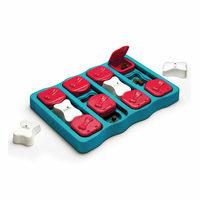 Most of the games can be made more challenging by locking some parts using pegs or blocks. 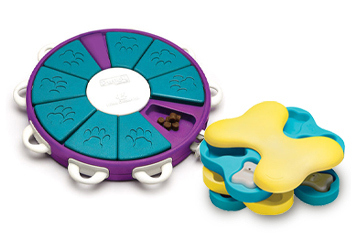 Your furry friend has to figure out that they have to lift them up to get the hidden treats in the compartments. However, this level of difficulty should only be introduced once a dog has mastered the lower level otherwise a game or toy would be frustrating rather than fun and rewarding. 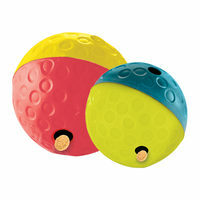 Another advantage of Nina Ottosson interactive dog toys and games is that they can be played anywhere. On good days, they can be played outside as your pooch gets to run around and get some sun and fresh air. On bad days such as in winter and fall, the games can be played indoors. 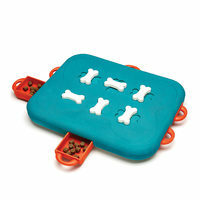 They are also excellent for keeping old and injured pets engaged, active and alert.